Discount Vape Pen has existed for awhile but they wanted their site to be easier to use and navigate. Their old theme made upgrades and updates difficult. We moved them to a new theme and gave their site a fresh design. On their old theme every Woocommerce update required them to completely reset their shop emails and constantly threw slow errors for no reason. The new theme has removed the slow errors and lets them safely update their software with no fears. The new design is robust and friendly. It is easy to navigate and focuses on helping you find the perfect vaping product. The built in menus let you drill down into tons of vaping categories and devices so you can find the perfect vaping product. 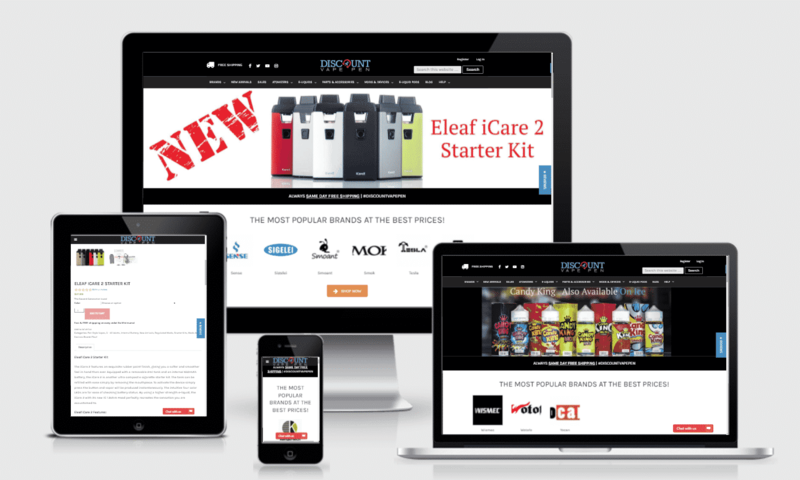 The new site is mobile responsive so customers can find their product regardless of the device they are shopping on. The site is easy to use, update, and contains custom video tutorials so they can do all their maintenance with ease. The site is fully synced with their inventory system so they do not have to worry about constantly updating their inventory manually. On the new theme they are able to easily embed videos to give a complete interactive overview of the product. We also installed some new marketing systems that will help them make sales and deliver the best possible value to their customers.